Delivers up to 3X more runtime, 20% more power and 2X more life than standard Li-Ion batteries. 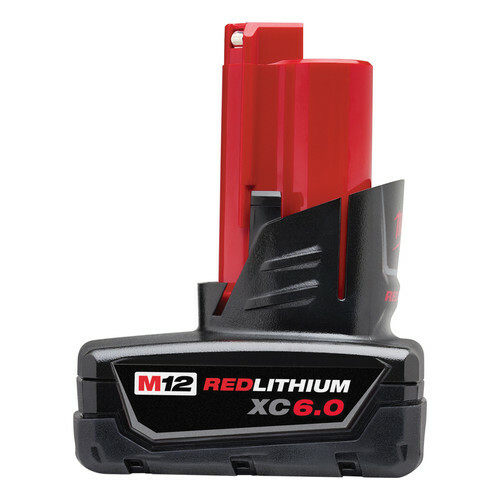 The M12 REDLITHIUM XC6.0 Battery Pack features superior pack construction, electronics and performance to deliver more work per charge and more work over the life of the pack than any battery on the market. With Milwaukee durability built into each pack, this battery runs cooler and performs in climates below 0-degrees F/-18-degrees C. Managed by Milwaukee's exclusive REDLINK Intelligence, the battery features overload protection to prevent you from damaging your cordless power tools in heavy-duty situations, while the discharge protection prevents cell damage. The temperature management system and individual cell monitoring help maximize battery life. Upgrade to the M12 REDLITHIUM XC6.0 Battery Pack Extended Capacity Battery Pack to instantly increase the runtime and durability of your Milwaukee M12 cordless tools. Great for light and heavy work especially rooftops, crawl spaces, great power light and convenient. Milwaukee 48-11-2460 M12 REDLITHIUM XC 12V 6.0 Ah Extended Capacity Lithium-Ion Battery Pack works very well and lasts a long time. It charges in a very acceptable time period. I have had no problems with this battery... It works as it should. I use this battery in my impact drill, gives me all day use. This battery is awesome! Completed an eight foot outdoor farm table using this battery in a 1/4" hex M12 FUEL impact driver. Drilled all the pocket holes and drove all the screws and still had three bars of battery left! Plenty of power. Great upgrade to your existing M12 tools! This is a great battery! I use it everyday at work. I have had it for about 3 weeks and only charged it once. I highly recommend this battery! Is this a single battery or two batteries? Description says a "pack", but specification does not clearly indicate it is two batteries. BEST ANSWER: It is a single battery but contains more plates or whatever medium holding the charge that is in the smaller 12V batteries. Can this be used in the m12 jacket? BEST ANSWER: Sure, it can. It's a bit bulky and if you have the 1st gen jackets it will be very difficult to squeeze into the battery pocket. Later jackets had larger or expandable pockets. I personally wouldn't run the M12 XC's in a jacket as the shape is so awkward. I'd first opt for the M18 adapter w an M18 compact battery; this setup is still bulky but is more of a flat brick shape. But honestly the best option is the new M12 compact 3.0's; same form factor but as many amp hours as the original M12 XC batteries. Yes, it will be uncomfortable on the body trying to do anything. BEST ANSWER: It normally takes one to two hours to charge the battery, it will depend on the charger used to charge the item. I have a M12 red lithium battery and charger that came with the heated vest and jacket but fella's I hunt with say that it is only a 1.5 amp battery and that is the reason when I both have the pockets and vest switches on, the battery only lasts about 2 hours. They say I should get a 4amp battery. what do I need to purchase?